Being in my 50's, my skin is a big concern to me. I have fine lines, a few deeper wrinkles, and my skin is beginning to sag a little especially at my jawline. I've tried several firming creams and serums with high hopes, but none of them have made much of a difference up until this point. 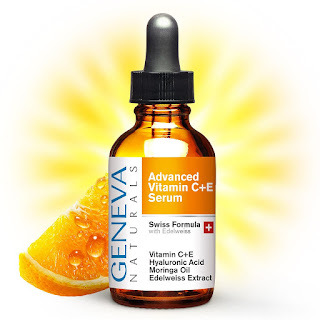 So ,when I was given the opportunity to try out Geneva Naturals Advanced Vitamin C+E Serum I was excited. I have done a little research on this product, as I do with anything I'm going to put on my skin. I really like that this is a natural product. No harsh chemicals to irritate my sensitive skin. It has a light citrus scent, and feels good on my skin. It absorbs quickly and doesn't leave a sticky feel at all. It actually gives my skin a nice, healthy glow. I can feel a slight tightening in my skin and have hopes of even more improvement with extended use. This serum contains 20% Vitamin C, Edelweiss (which is a special anti-aging plant that grows in the Swiss Alps) combined with Hyaluronic Acid, Coconut Oil, Moringa Oil & Vitamin E.
I received this product at a discount for my honest unbiased opinion.